Elsie Sloane is the sister of Tom Sloane and the daughter of Angier and Kay Sloane. Elsie makes only two small appearances in Is it Fall Yet?, where she displays a somewhat cynical and bitter attitude. She shows an antagonistic relationship with Tom, randomly attacking him for "quasi-rebelliousness" and getting accused by him of having "faux-jadedness". She was the first one of the Sloanes to recover from one of Daria's jokes and start laughing, though her initial reaction (despite her cynicism) was worried confusion. 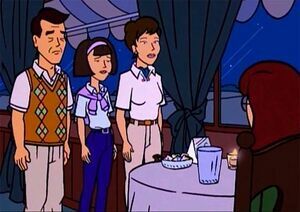 Notable fanfics starring Elsie include "But Now Is Found," where she becomes the best friend of a younger, alien abductee Daria. She is a recurring antagonist in "God Save The Esteem," opposing Tom and Daria's relationship. At the beginning of the story she and Tom are attending Lawndale High, and she, rather than Quinn, is Sandi's rival in the Fashion Club. A younger Tom and Elsie resort to any means necessary to get out of visiting Mildred at the Cove in "Last of the Summer Whine". Quiverwing created the first artworks featuring Elsie, all based on a popular series. Since then, TonyOrk and CreepyDan have also created artwork of Elsie Sloane. This page was last edited on 23 April 2018, at 20:03.